In a large deep frying pan, cook the bacon over moderate heat until crisp. Remove with a slotted spoon and reserve. Season the chicken thighs with 1/2 teaspoon of the salt and the pepper and add to the pan in batches if necessary. Cook, turning, until browned, about 8 minutes. Remove from the pan. Pour off all but 1 tablespoon of the fat. Add the onion, carrot, and apple to the pan. Cook over moderate heat, covered, for 5 minutes. Stir in the sauerkraut, bacon, broth, the remaining 1/4 teaspoon salt, the mustard, juniper berries, and bay leaf. Arrange the chicken in an even layer on top. Bring to a simmer, reduce the heat, and cook, covered, until the chicken is just done, about 25 minutes. Remove the chicken from the pan and discard the bay leaf. If too much liquid remains in the pan, raise the heat to moderately high and cook until slightly thickened. 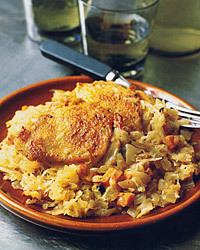 Serve the sauerkraut topped with the chicken. For a white wine that will contrast nicely with the sauerkraut, look for a soft, full-flavored, and unoaked white. Gewürztraminer or Pinot Gris from Alsace in France are ideal choices.